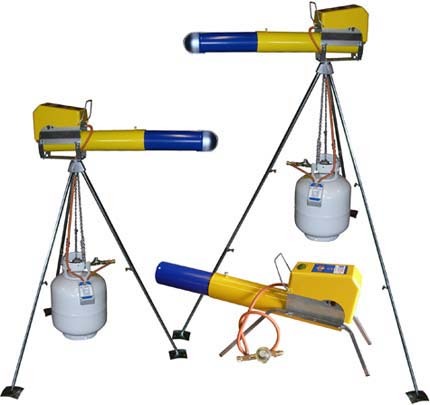 Zon bird scaring cannons and accessories can be purchased at our online store. If you'd like to rent propane cannon equipment, please contact us toll-free: 866/280-6229. Your *deposit for the purchase price of the merchandise will be held as security until all equipment has been returned in good order. *When your deposit is paid by check, we will hold the check undeposited. When your deposit is paid by credit card (VISA, MasterCard, Discover), the purchase price is "authorized" to your card. This authorization is not an actual charge to your card, but it does render the funds inaccessible to you until the authorization is released (ie: upon return of the equipment in good order). Credit card note: Account transactions viewed online or on statements show authorizations as pending charges. In the event of unusual wear or damage to the unit, the cost of necessary repairs will be added to the rental charges. If after trying our bird scaring equipment you wish to purchase your rental unit, 50% of the rental fees for that unit will be applied to the purchase price. When rental units are shipped, shipping charges are due, but transit time will not be included in the rental period. Rental equipment is sometimes available for sale and may be purchased at varying discounts dependent upon condition. Zon is the original bird scaring cannon and is incomparable to inferior products on the market - don't accept imitations!